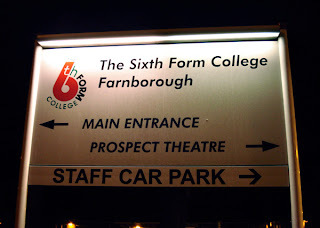 The biggest sixth form in Britain, close to the British Military Headquarters, teachers from the Film and Media department who have organised trips to Cuba and a very sympathetic principal… exciting stuff for the last few days of the speaking tour and off we went on a train from London to Farnborough in Hampshire, comrades Yoselin Rufin and Jesus Garcia and members of Rock around the Blockade. 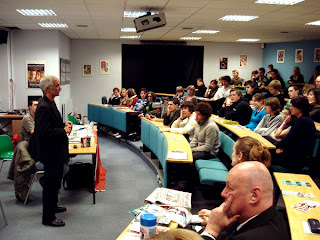 The classroom was full by 7pm with a total of 70 people, 60 of whom were students of the college. What an inspiration to have that many young people willing to go home after a day’s schooling and return to hear about Cuba. A tribute indeed to the work of Jane Thomas, Film and Media teacher who invited Rock around the Blockade, John Marks, head of Film and Media who initiated the college’s trips to Cuba a few years ago, and John Guy, the principal of the college who has supported these projects. After an introduction to the work of Rock around the Blockade, the audience was treated to a talk by our Cuban comrades who eloquently described the project and the process of their Revolution and building socialism. 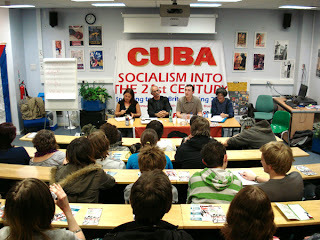 Jesus Garcia addressed the students with a quote from a Russian poet, ‘communism is the youth of humanity’, and went on to describe the importance of young people in the struggle for a better future, quoting Rosa Luxembourg on the fate of humanity, ‘socialism or barbarism’ but adding ‘if we don’t disappear first’. Our tasks are urgent. Jesus Garcia described the Cuban electoral system, with the people at the top, in a way that clarified the issues about the attempts to develop a society where people are involved in making decisions about their society, reminding us that the elected representatives are not paid more than they were and continue to do their jobs. They must regularly update the electorate on their works and can be recalled at any time if they are not performing as their electorate want. It is a mutual relationship in order to continuously improve the society and solve all problems that come up. Yoselin Rufin spoke of life for young people in Cuba particularly with respect to their education possibilities and the young teachers in Cuba today who continue their studies while teaching in the new projects of the municipalisation of university education. Yoselin put this in the context of the Battle of Ideas which started with the victorious campaign to bring home Elian Gonzalez. Of the 609 delegates to the national assembly, almost one third are under the age of 30 and of the 31 elected members of the council of state, the collective body of the national assembly of which Raul Castro has just been elected president, there are four students. 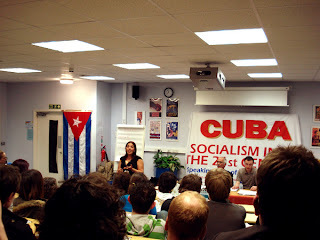 Questions from the floor were many and varied, including membership of the communist party and whether that was a necessity to be elected, whether it is possible for the elected representatives to not have socialist views, to what extent arts are funded in Cuba, about the youth at the time of the Bay of Pigs invasion and the missile crisis, how Fidel Castro fits into the electoral system and what his role is now, what the outcome of the US elections will be for Cuba, how Cuba can afford the education system and free university access for all, what people in Cuba think of Raul Castro and finally how we can implement socialism in Britain. Comrades Jesus and Yoselin answered these questions fully, expanding on the fact that Communist Party membership is not a prerequisite for anyone being nominated, selected or elected at any level of their system. Over the years, of the hundreds of thousands of people who have been elected in Cuba, none has been trying to destroy the Revolution, not because they couldn’t be elected but because they don’t have the social base to back up their candidacy. However, those who are elected are constantly critical of the system in a constructive way of dialogue and debate in order to take their process forward and improve society. The expansion of art colleges and teachers of arts has been one of the programmes of the Battle of Ideas. Jesus talked of the time of the Bay of Pigs invasion and the incredible response from the young people with the voluntary brigades and the mobilisation in all sectors of the economy. Fidel Castro remains an elected member of the municipal assembly, no longer in the Council of State as he didn’t stand, but with the authority of a leader of the Cuban people for over 50 years, loved and respected for his teachings and example and his ability to unite people in struggle. Raul Castro is a leading revolutionary in Cuban society, respected for his role of the last fifty years and elected on this basis, not related to the fact, as our media would have it, that he is Fidel’s brother. With respect to the US elections and a change of President, only time will tell. We discussed the Cuban 5, imprisoned in the US under a Clinton administration. Cuba however has survived the blockade, the siege that they are under and can and will continue to build their society whatever the imperialists do. This led to a discussion of the planned economy under socialism, how the system of production is driven by the political needs of their society. The discussion ended with a note of what we can do in Britain and the fact that we all have a role to play, that it is up to us to help raise the level of consciousness about the global situation, that the market cannot provide for the majority of humanity and that the capitalist system itself needs changing. Cuba inspires us because it shows that another world is possible and society can be organised towards the emancipation of human beings, for development to their maximum potential. Long live the youth of today!